She died in 2003 aged 70 in France, released her last album in 1993, had her only UK hit single My Baby Just Cares For Me reached No.5 in 1987 – 29 years after its album release – and had a reputation for cantankerous live shows. Despite Laura Mvula’s recent ‘Nina Simone And Me’ homage for BBC4 TV and Radio 6 Music, plus the musical quotes used by rappers Jay Z and Kanye West, I have a hunch that Nina’s life and work is especially wide of most younger people’s radar unless they have left-wing connections or have delved into US Civil Rights Movement history. So a new documentary released by Netflix on 26 June 2015 brings a welcome opportunity to revive her reputation as a vital, continuing muse for future musicians. 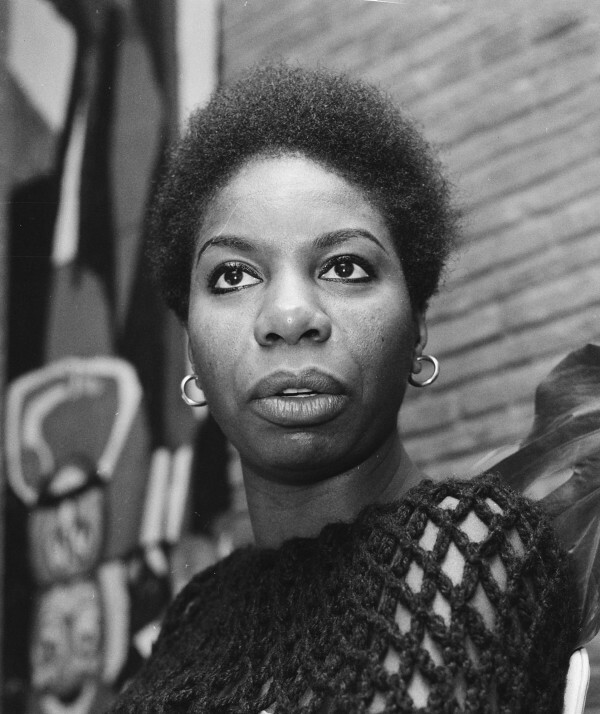 Liz Garbus’ What Happened, Miss Simone is not the first attempt to tell Nina’s story . Penguin books published a ghosted autobiography I Put A Spell On You in 1991. There have been subsequent written accounts by fans and critics. The benchmark film documentary hitherto has been Frank Lords’ Nina Simone: The Legend released in 1990. It benefitted from contributions by her first boyfriend Edney Whiteside, two brothers from her seven siblings, and most poignantly Nina’s Methodist preacher mother Mary . Nina’s health was then clearly compromised by the medication she had been prescribed for a bi-polar condition. Thus her comments seem ponderous and her eyes in fright on camera as she was taxied down significant urban streets and revisits her childhood home. Eunice Waymon (Nina Simone’s birth name) had been a child prodigy in this small mountain resort town of Tryon, North Carolina, once a rambling and horse-riding retreat for rich Southerners during steamy summer months. She astonished her mother aged only 3 by faultlessly picking out a hymn on the home piano. Everything that happened to me as a child involved music. It was part of everyday life, as natural as breathing. As well as piano Daddy played guitar and harmonica and led the choir in church; momma played piano and sang too. Whether leading her mother’s church services or spending up to seven hours a day in practice Eunice was obsessively devoted to becoming a classical pianist, possibly the very first black female to do so in the USA. It was the lady her mother cleaned for, Mrs. Miller, who paid for Eunice to have lessons with the local English wife of a Russian painter – Muriel Massinovitch. Eunice was not conscious personally of racial discrimination blocking her path until aged 12 she found her parents being shown to a back row seat in the town auditorium as she was about to give one of her recitals. From the stage she ordered her parents to be sat in the front row. Eunice was later sent fifty miles north to a private high school in Asheville, where she practiced from 4 – 9 in the mornings. Later she went to the prestigious Julliard School in New York for a year’s tuition. But the signal event that shaped the rest of her life was her failure to win admission to Philadelphia’s Curtis Institute of Music. So confident were her family that they had decided to move there to be near her. But she was told she wasn’t good enough. Eunice learned from her brother Carroll, after he talked with their uncle Walter who had lived in the city for many years and was friends with the likes of black opera singer Marion Anderson, that Curtis Institute was thinking of recruiting more black students. …but if blacks were going to be admitted then they were not gong to accept an unknown black, that if they were going to accept an unknown black then it was not going to be an unknown black girl, and if they were going to admit an unknown black girl it wasn’t going to be a very poor unknown black girl. People who knew – I was told – white people who knew, said the reason I was turned down was because I was black. Reeling from this sudden blow of triple discrimination Eunice had to reorientate her life quickly to make a living at the only thing she knew how – music. To spare her mother’s wrath at playing the devil’s music she concocted a pseudonym from the Spanish word for small girl and the first name of her favourite film actress. No longer the hushed centre of attention in a school, college or town hall Nina had to fight to be heard in the small late-night bars and clubs of Atlantic City.She also had to develop her voice. She had simply never sung before. Aged 25 Nina was breaking into New York City’s Greenwich Village venues, releasing her first album and getting a first Top 40 hit with her version of Gershwin’s I Love You Porgy. This new documentary adds significantly to the existing story. Garbus’ chief coup has been to present painful testimonies to camera from her second husband Andy Stroud and their daughter Lisa that reveal much of the domestic turmoil in Nina’s life. Stroud was a Harlem cop who befriended then married and managed Nina during her most prolific and wealthy decade. Nina would go on to chastise him for treating her as a money-spinning workhorse, disapproving of her overt politics and guilty of physical and sexual abuse. Lisa had playwright Lorraine Hansberry for a godmother and spent most of her childhood in the company of suburban Mount Vernon, Westchester County neighbours – the six children of Malcolm X and Betty Shabazz. Critical of her mother’s neglect Lisa doesn’t pull any punches about how difficult Nina was to love as a daughter, preferring to go back to her father as a teenager after living in Liberia and Switzerland with mum. Liz Garbus has also excavated copious extracts from Nina’s scribbled diaries, some very frank yet relaxed radio interviews, and friends’ photos. Thus in Nina’s own words we come to understand how she strove to be an independent professional yet political artist, increasingly driven towards militant black nationalism by racism’s excesses but also setting the bar higher than ever for female musical artists. She moulded Langston Hughes’ words into the ironic outrage of Mississippi Goddam after the 1963 Birmingham, Alabama church bombing that killed six young girls, a work that clashed with the much meeker anthems of its time – We Shall Overcome and Blowin’ In The Wind. In 1965 Nina marched from Selma with Martin Luther King, performing on its fourth night. In 1969 she set the title of her mentor Lansberry’s posthumous collection of writings – Young, Gifted and Black – to music with words by Weldon Irvine, to become a much covered cry for black pride and freedom. Nina broke new ground with her frankness about women’s sexuality and race. Four Women and The Other Woman. She wasn’t shy of calling herself a revolutionary that discussed Marx and Lenin with her trusted mentor Lorraine Hansberry. But Nina could never be dismissed as a mere propagandist even if publicists caricatured her as the High Priestess of Soul in contradistinction to Aretha’s Queen of Soul. There are a string of artistic reasons why Nina was so unique, and they are explicit in this new film. The first is her general disregard for musical genre. The lyrics, melodies and rhythms of Nina’s songs, whether self-written or covers, draw from folk, jazz, blues, soul, country, gospel, Latin, Broadway and other conventions, blended within the same song at times. She always prioritised the emotional impact of any song and would choose any technical or structural approach to achieve that. Genre boundaries are much more important to marketing managers than artists anyway. I have listened to her ‘Forbidden Fruit’ album produced in 1961 since 1964. Not sure how I got it on vinyl aged 13 but it remains a timeless classic for me, largely for this generic mix. This ranges from her deeply soulful singing and a single piano note punctuating her guitarist’s solo bridge in Just Say I Love Him, to the gentle swing of I Love To Love, the forceful blues of Work Song and the playful children’s song of the album’s title written by Oscar Brown. Secondly there is her piano playing. Every one of Nina’s recordings features some fascinating and brilliant piano accompaniment. Whist this is hardly surprising given the level of hard work she had invested as a child, she did not flinch from improvising an often mischievous melodic counterpoint quoting works from her beloved classical idols in a blues or jazz song. There has simply never been a popular female artist to rival her keyboard skills. Thirdly, there is her voice. A kind of androgenous contralto with added range Nina’s voice is utterly remarkable for someone who used it so relatively late in her career. Perhaps that explains why? But sharing perfect pitch with her loyal friend guitarist Al Schackman, she was free to vary her live performances’ choice of keys knowing he would pick up immediately on where she was heading musically. This invariably meant laying her heart open for all to know, with an unrivalled intimacy, joy or anger. Ok, she never soared to the upper registers that Aretha thrilled us with, but she could manipulate vibrato with the best. Fourthly is her love of performance. Time and again Nina shows her roots in the churches of her youth where audience participation was energetic. Nina learned how to drive and control audience moods and responses. “Do I Move You” sums this up, unambiguously coming on as a sexual rather than religious quest, but still proving her love of audience response! The sad flipside of this in later years was her string of no-shows, bitter arguments with audiences, rants at technicians and staff as well as truncated sets. It was difficult for her devoted fans to forgive these episodes – yet most did. Liz Garbus and her team have done us all a massive favour in getting this new look at Nina produced. Essential viewing even though it will cost you a subscription to Netflix!!! Tell your friends all about it.